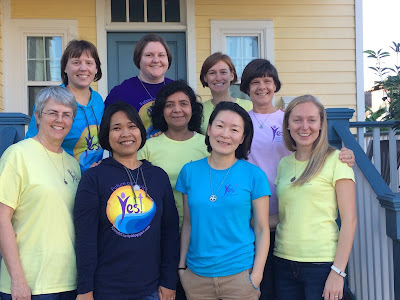 This past weekend, eight members of the Future of Charity and one discerner gathered at the House of Charity in New Orleans for fellowship and faith-sharing. Guiding our prayer and conversations was the theme of self-awareness and identity. As we listened to Jesus ask his disciples, Who do people say that I am? and Who do you say that I am? (Mk 8:27-30) we asked ourselves: Who do I say I am? and Who do we say we are? From playing sports and building forts. a secret fortress in the yard. We are from the forest and oceans. from brown skin, white rice and coconut milk. coaching our teams, caravanning kids, and filling up gas tanks. We are from Sr. Armella and faithful Sunday­ Worship. God the Father of light bless this Advent candle. We are from a sharp contrast between independence and interdependence. We are from a house without borders. whose canopy of leaves made the perfect place for singing. though sensitive strings were rarely touched. yet embracing one another's faults. We are from the love that is stronger than the wounds. From the women and men on whose shoulders we stand. who not too long ago dreamed of a future together. We are women of courage. We are bridge-builders and seekers of peace. We are Sisters of Charity in a global world. We are women held, formed, and challenged in community. We are able to see the light in the darkness. We are women vowed to God. Thank you to everyone who kept us in their prayers during our time together!